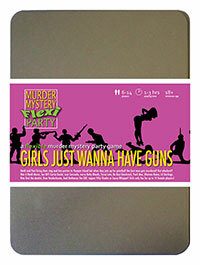 You've been invited to play the role of Dharma Rama in Girls Just Wanna Have Guns. Heidi and Paul are throwing their pre-wedding parties at luxury spa and adventure resort, Pamper Island. But after one too many drinks, the bride and her entourage are invited to 'hunt the stag' with paintball guns - and best man Steve Wingman meets a grisly end! Can you find out who murdered him? Grab your guns and get ready for a facial at the luxury spa and adventure resort of Pamper Island! You’re always ready for some red carpet action so if you’re not wearing an evening dress with a plunging neckline and thigh-high slit, you slum it with a little black dress and diamond studded handbag. You are an old school friend of the bride’s. You both frequently got out of trouble by acting innocently, but you became so good at it (and there was so much trouble to evade) that you developed a knack for it. Now you’re the lead in a hit TV series “Tossed in Austen”, a British costume drama based on Pride and Prejudice that’s set in a salad kitchen. You long for Hollywood success but your only offer so far is “Mansfield Pork” which your agent declined on your behalf without showing you the script. I’m Dharma and I’m in shock, can’t you see? Not really, that’s just my acting chops. You probably recognise me from the hit Brit costume drama “Tossed in Austen” but I won’t bore you with that. I’m pretty sure this murder mystery business will only further bolster my CV for Hollywood so let the show go on as they say. Oh, sorry - Steve…! I only met him today, he’s an awful pervert isn’t he?